Alejandra Espinosa, Rodrigo Valenzuela B., Daniel González-Mañán, Amanda D’Espessailles T., Juan Guillermo Gormaz , Cynthia Barrera R., Gladys Tapia O.
Non-alcoholic fatty liver disease (NAFLD) is triggered by a nutritional-metabolic alteration characterized by triacylglicerides acumulation, insulin resistance (IR), oxidative stress and depletion of polyunsaturated fatty acid (PUFA). The n-3 PUFA, such as eicosapentaenoic (EPA) and docosahexaenoic (DHA) acids, would be hepatoprotective against the development of NAFLD by stimulating lipolysis and inhibit lipogenesis. So, fish oil supplementation (EPA + DHA) prevents HFDinduced NAFLD. In this context, the aim of this study is to evaluate the correlation between liver oxidative stress with IR and levels of PUFA in supplemented mice. Male mice C57BL/6J (n=9) were fed for 12th week: a) control diet (20% protein, 70% carbohydrate, 10% lipids), b) control diet and fish oil supplementation (200 mg EPA+DHA/kg/day), c) high fat diet (20% protein, 20% carbohydrate, 60% lipids), and d) high fat diet and fish oil supplementation. Liver steatosis (histology), insulin resistance (HOMA), liver oxidative stress (GSH/GSSG, carbonyl protein and 8-isoprostanes) and liver fatty acid content were evaluated. The significant decrease in liver oxidative stress parameters (p<0.05, ANOVA followed by Newman Keuls test) were correlated (Pearson test) with HOMA and levels of PUFA, along with the hepatoprotection observed. It concludes that prevention of NAFLD by supplementation with fish oil (EPA+DHA) is dependent of the prevention of liver oxidative stress, IR and PUFA depletion. La enfermedad por hígado graso no alcohólica (EHGNA) está provocada por una alteración metabólico-nutricional caracterizada por la acumulación de triacilglicéridos, resistencia a la insulina, estrés oxidativo y disminución de ácidos grasos poliinsaturados (AGPI). Los AGPI ω-3, como los ácidos eicosapentaenoico (EPA) y docosahexaenoico (DHA), serían hepatoprotectores contra la EHGNA al estimular la lipolisis e inhibir la lipogénesis hepática. La suplementación con aceite de pescado (EPA + DHA) previene la esteatosis hepática inducida por una dieta alta en grasas. En este contexto, el objetivo de este estudio es evaluar la correlación entre el estrés oxidativo hepático, la resistencia a la insulina y los niveles de AGPI ω-3 en ratones suplementados. Ratones machos C57BL/6J (n=9) alimentados durante 12 semanas con: a) dieta control (20% proteína, 70% hidratos de carbono, 10% lípidos), b) dieta control y suplementación con 200 mg de EPA+DHA/kg/día, c) dieta alta en grasa (20% proteína, 20% hidratos de carbono, 60% lípidos), y d) dieta alta en grasas más EPA+DHA. Se evaluaron la esteatosis hepática (histología), resistencia a la insulina (HOMA), estrés oxidativo hepático (GSH/GSSG, proteínas carboniladas y 8-isoprostanos) y el contenido de ácidos grasos hepáticos. La disminución significativa en los parámetros hepáticos de estrés oxidativo (p <0,05, ANOVA seguido de Newman-Keuls) se correlacionó positivamente (test de Pearson) con el HOMA y los niveles de AGPI ω-3, junto con la hepatoprotección observada. Se concluye que la prevención de EHGNA por suplementación con EPA+DHA, se acompaña de una correlación inversa entre el estrés oxidativo y la resistencia a la insulina y la disminución de AGPI ω-3 hepáticos. Palabras clave: Acido docosahexaenoico, acido eicosapentaenico, resistencia a la insulina, ácidos grasos ω-3, enfermedad por hígado graso no alcohólica, estrés oxidativo. Medical Technology School, Nutrition and Dietetics School, Molecular and Clinical Pharmacology Program, Institute of Biomedical Sciences Faculty of Medicine, University of Chile, Santiago, Chile. Non-alcoholic fatty liver disease (NAFLD) is characterized by pathological accumulation of fat at hepatic level in the absence of any other disease related to liver steatosis, which includes a wide spectrum of liver diseases ranging from mild asymptomatic fatty liver to non-alcoholic steatohepatitis (NASH) and cirrhosis (1). NAFLD is considered the hepatic expression of the metabolic syndrome, a condition associated with hypertension, insulin resistance (IR), obesity and dyslipidemia (2). Although the pathogenic mechanisms involved in hepatic lipid accumulation are not completely understood, liver steatosis may result from an imbalance between lipid availability, either from enhanced blood uptake and/or de novo lipogenesis, and lipid disposal, either from decreased mitochondrial and peroxisomal fatty acid (FA) β-oxidation and/or reduced ability of lipid output by the liver (3). The establishment of steatosis in the liver may eventually lead to lipid peroxidation with production of concomitant hepatic injury (4). Alterations in the bioavailability of long-chain polyunsaturated fatty acids (LCPUFAs) occur in cardiovascular disease, obesity, type II diabetes, and NAFLD, in association with the inflammatory response component of these pathologies (5,6). NAFLD is characterized by impairment in the bioavailability of liver n-6 and n-3 LCPUFAs, with concomitant significant depletion of n-3 LCPUFA content and enhancement in the n-6/n-3 LCPUFA ratio (6). It is important to point out that LCPUFAs are crucial components for membrane functions, due to their role in establishing adequate membrane fluidity, or signalling functions due to their role as second messengers regulating signal transduction processes, with a minor contribution to the energy reserves within the cell (7). Under physiological conditions, the liver is able to synthesize most of LCPUFAs from dietary precursors, whereas other organs such as testicles and brain have a limited capacity (8). Within the n-3 fatty acid family, eicosapentaenoic acid (C20:5 n-3, EPA) and docosahexaenoic acid (C22:6 n-3, DHA) are the most important fatty acids since they are involved in several functions in the normal development of human from their early embrionary life to the elderly (9). DHA is important during fetal and postnatal neurogenesis (9). Similarly, health properties (anti-inflammatory and anticoagulant) of EPA suggest that the consumption of this fatty acid is beneficial in the prevention and treatment of nontransmissible chronic diseases and other inflammatory diseases (5,10). In fact, prevention of ischemia/reperfusion injury in the the liver by n-3 LCPUFAs has been established (11). Furthermore, recent studies suggest that the anti-steatotic effects of EPA and DHA in the liver include directing fatty acids away from triglyceride storage with promotion of their oxidation, as well as an enhanced glucose flux to glycogen synthesis (12). In the view of these considerations, the present study was aimed to test the hypothesis that dietary fish oil supplementation prevents liver steatosis and IR induced by high fat diet administration in mice, and correlates IR and PUFA depletion with liver oxidative stress. For this purpose, parameters related to the metabolic syndrome (serum glucose, insulin), liver oxidative stress (GSH/GSSG, protein carbonyl and 8-isoprostanes), liver steatosis (morphological characteristic) and fatty acid composition were determined. Weaning male C57BL/6J mice weighing 12-14 g (Bioterio Central, ICBM, Faculty of Medicine, University of Chile) were randomly assigned to each experimental group and allowed free access to specially formulated control or high fat diets (control diet: 10% fat-derived kcal, 20% protein, and 70% carbohydrate; high fat diet: 60% fat-derived kcal, 20% protein, and 20% carbohydrate; Research Diet INC, Rodent Diet, Product data D12450B and D12492, USA). Animals received water ad libitum and were housed on a 12-hour light/dark cycle. From days 1 to 84 (12 weeks), the n-3 PUFA supplemented groups received fish oil (Acolest TG Product. Procaps, Colombia) and the control groups isovolumetric amounts of saline, thus comprising four experimental groups: (a) control diet (control), (b) control diet plus fish oil, (c) high fat diet (HFD), and (d) HFD plus fish oil. Under these conditions, the fish oil groups received oral supplementation of 200 mg/kg/day of fish oil, which contained 108 mg/kg/day of EPA and 92 mg/kg/day of DHA. Weekly controls of body weight and diet intake were performed through the whole period. At the end of the 12th week, animals were fasted (6-8 h), anesthetized with ketamine/xylazine (150 mg/kg/10 mg/kg). Blood samples were obtained by cardiac puncture for serum AST, ALT, glucose and insulin assessments. Liver samples were frozen in liquid nitrogen (for determination of fatty acid composition) or fixed in phosphate-buffered formalin, embedded in paraffin, and stained with hematoxylin-eosin (for morphology assessment). The histology score was defined as the sum of the steatosis and inflammation scores, both graded as absent (0), mild (1), moderated (2) and severe (3) (13). Experimental animal protocols and animal procedures complied with the Guide for the Care and Use of Laboratory Animals (National Academy of Sciences, NIH Publication 86-23, revised 1985) and were approved by Ethics Committee of the Faculty of Medicine, University of Chile (CBA 0386 FMUCH). Serum glucose (mM) was measured using specific diagnostic kits (Wiener Lab, Argentina). A commercial immunoassay kit for mice serum insulin assessment (μU/mL) was used, according to the manufacturer’s instructions (Mercodia, Uppsala, Sweden). IR was estimated by the homeostasis model assessment method (HOMA) [fasting insulin (μU/mL) × fasting glucose (mM)/22.5]. In anesthetized animals, livers were perfused in situ with a cold solution containing 150 mM KCl and 5 mM Tris (pH 7.4) to remove blood. Total reduced glutathione (GSH), carbonyl protein and total protein contents were measured (14). 8-isoprostanes (pg/g) were measured using specific diagnostic kits (Cayman 8-isoprostanes EIA kits, USA). Fatty acid analyses of both diets and liver samples were performed by gas-liquid chromatography (GLC). Samples were assessed for lipid extraction according to Bligh and Dyer (15) and transformed into fatty acid methyl esters (FAME) with methanolic boron trifluoride (12% methanolic solution), and stored at –20 °C until analysis. The GLC of FAME was performed using Hewlett-Packard equipment (model 6890A), with a capillary column (Agilen HP-88, 60m 3 0.25mm; I.D. 0.25 mm) and flame ionization detector for FAME detection. Hydrogen was the carrier gas. The retention times of FAME were compared to a standard mixture (Nu-Check Prep). C23:0 was used as internal standard. Fatty acids were expressed as g/100g liver. Net changes in hepatic EPA and DHA induced by HFD was calculated by subtracting mean values in the control diet group from individual values in the group subjected to control diet supplemented with fish oil and the mean values in the HFD group from individual values in the group given HFD and fish oil. The statistical analysis was performed using the GraphPad Prism 5.0 software (GraphPad Software, Inc. San Diego, USA). The values shown represent the mean ± SEM for the number of separate experiments indicated. Statistical significance of differences between mean values was assessed by a one-way ANOVA and the Newman-Keuls test. A p-value of <0.05 was considered significant. The Pearson order correlation coefficient was used. There were significant differences in the final weight but not in the initial weight. The (c) group (39.8 ± 7.7 g) presented the higher increment in the body weight compared to the other groups. Also within the other groups there were not observed significant differences in the body weight (a=33.2 ± 1.1 g; b=29.2 ± 2.9 and d=32.5 ± 3.5). The (c) group showed the higher increment in liver steatosis compared to other groups with severe liver steatosis (60-80% micro and macro vesicular) (Fig. 1C). Other groups did not show liver steatosis; groups (a) and (b) under 5% (Fig. 1A and 1B), group 8d) under 10% micro and macro vesicular (Fig. 1D). FIGURE 1. Effect of fish oil supplementation on liver histology in mice subjected to high fat diet (HFD). 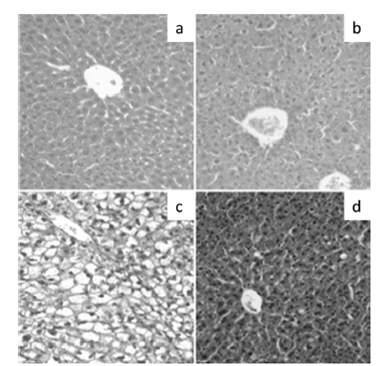 Representative liver sections from animals given (a) control diet, (b) control diet plus fish oil, (c) HFD, and (d) HFD plus fish oil (hematoxylin-eosin liver sections from a total of 9 animals per experimental group; original magnification x 40). Table 1 shows the insulin resistance index (HOMA) in the experimental groups. The (c) group presented the higher value in HOMA compared to other groups. Although HOMA of (d) index is greater (P<0.05) than (a) and (b) groups, this value lies within normal ranges. TABLE 1. Liver oxidative stress parameters and homeostasis model assessment (HOMA) index for all experimental groups. Values represent means ± SDM for twelve mice per experimental groups: (a) control diet (b) control diet plus fish oil (c) HFD (d) HFD plus fish oil. Significant differences between groups are indicated by the letters identifying each group (P<0.05 one-way ANOVA and Newman-Keuls test). Table 1 shows the liver parameters related to oxidative stress in hepatic samples. The (c) group showed a significant depletion of total GSH/GSSG and an increment in protein carbonyl and 8-isoprostanes levels compared to the other groups. Within the other groups there were not observed significant differences although (d) group showed higher 8-isoprostane value compared to (a) and (b). 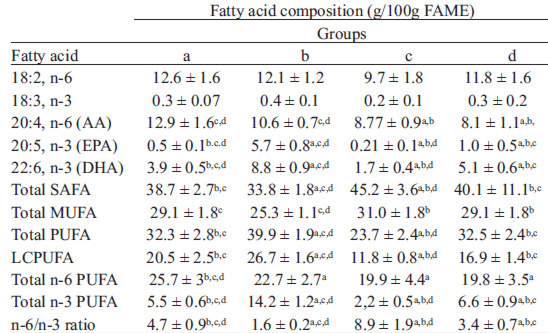 Table 2 shows the fatty acid composition of hepatic samples. Total saturated fatty acid (SAFA) content was significantly higher in HFD mice compared to all other experimental groups. However, control diet and HFD plus fish oil groups showed higher total SAFA value compared to control diet plus fish oil group. Total monounsaturated fatty acid (MUFA) content was significantly higher in HFD group compared to control and control diet plus fish oil groups. Total polyunsaturated fatty acid (PUFA) and long-chain polyunsaturated fatty acid (LCPUFA) content were significantly higher in control diet plus fish oil group compared to the other groups; control diet and HFD groups did not shown significant differences in PUFA and LCPUFA contents. Control group showed an increased n-6 total PUFA content compared to all others group; in contrast, n-3 total PUFA content was higher in control diet plus fish oil group compared to the all other groups. However, in the HFD group the value was significantly low compared to control without supplementation and HFD plus fish oil. 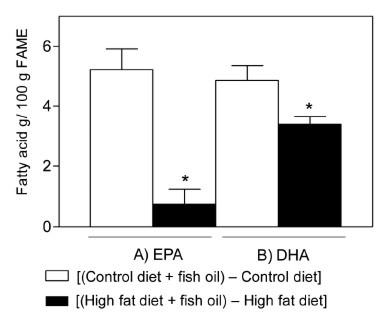 In other hand, EPA and DHA content were significantly different in all groups; the highest value was observed in control diet plus fish oil group and it was significantly low in HFD group. In addition, the n-6/n-3 ratio was also significantly different in all groups; it was significantly high HFD group compared to all others and significantly low in control plus fish oil. The net changes in liver EPA and DHA content induced by HFD in non-supplemented and subjected to fish oil supplementation mice were significantly different; EPA and DHA were significantly reduced in mice fed with HDF. However, EPA was significantly more reduced than DHA (Fig. 2). TABLE 2. Fatty acid composition of total lipids in hepatic tissue for all experimental groups. ± SDM for twelve mice per experimental group. Significant differences between groups are indicated by the letters identifying each group (P<0.05 ANOVA and the Newman-Keuls test). Saturated fatty acid (SAFA) are 12:0, 14:0, 16:0 and 18:0. Mono-unsaturated fatty acids (MUFA) are 14:1, n-7, 16:1,n-7 and 18:1. Poly-unsaturated fatty acids (PUFA) are 18:2,n-6 and 18:3,n-3. Long-chain poly-unsaturated fatty acids are 20:4,n-6, 20:5n-3 (eicosapentaenoic acid, EPA), 22:5,n-3, and 22:6,n-3 (docosahexaenoic acid, DHA). Table adapted from Valenzuela et al., 2012 (18). FIGURE 2. Net changes in hepatic EPA and DHA induced by HFD) in non-supplemented mice and animals subjected to fish oil supplementation. Values shown means ± SDM for net changes in EPA and DHA contents in control diet and high fat diet, of nine mice per experimental group. P< 0.05 assessed by Student’s t-test for unpaired data. In the studied mice, insulin resistance (HOMA index) was correlated with the liver parameters of oxidative stress, where the HOMA index was positively correlated with the protein carbonyl (r=0.82; P<0.0001) (Fig. 3A) and 8-isoprostanes (r=0.78; p<0.0001) (Fig 3B), and negatively correlated with GSH/GSSG ratio (r=0.5; p<0.001) (Fig 3C). FIGURE 3. 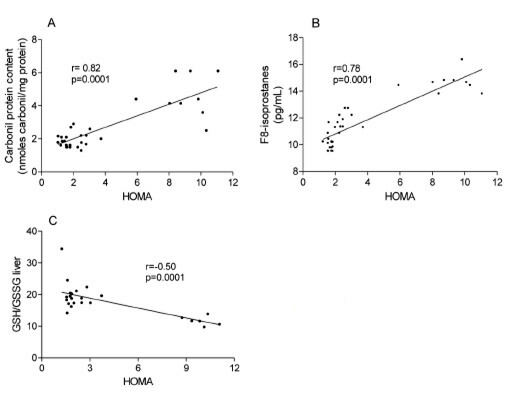 Correlation between liver oxidative stress and insulin-resistance in all experimental groups: (A) liver 8-isoprostane and HOMA, (B) liver carbonyl protein and HOMA, (C) GSH/GSSG and HOMA. The liver oxidative stress, specifically the lipoperoxidation indicators (8-isoprostanes) was correlated with liver fatty acid composition. The liver oxidative stress was positively correlated with SAFA (r=0.71; p<0.0001), MUFA (r=0.75; P<0.0001) (Fig. 4a) and n-6/n-3 ratio (r=0.73, p<0.0001) hepatic content. However, the PUFA (r=-0.81; p<0.0001), LCPUFA (r=-0.80; p<0.0001), n-6 total PUFA (r=-0.58; P<0.0003), n-3 PUFA (r=-0.71; p<0.0001), EPA (r=-0.50; p<0.001) and DHA (r=-0.66; p<0.0001) hepatic content were negatively correlated with liver oxidative stress (Fig. 4a and 4b). FIGURE 4a. 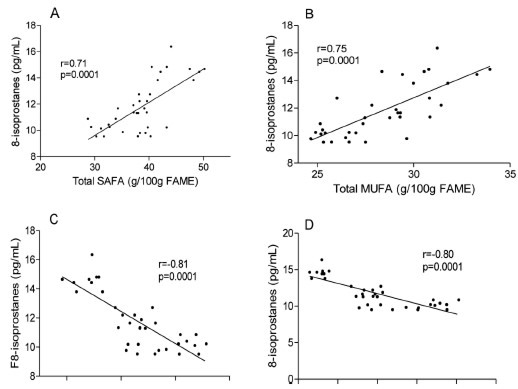 Correlation between lipid liver oxidative stress and fatty acid composition of liver total lipids: (A) SAFA, (B) MUFA, (C) PUFA, (D) LCPUFA. The data presented showed that HFD in mice induces liver macro and microvesicular steatosis, IR, liver oxidative stress and depletion of PUFA, especially n-3 PUFA. Alterations related with oxidative stress were generated by the increasing availability and oxidation of fatty acid in the liver (4), and the increment in generation of reactive oxygen species (ROS) in mitochondria (3). The liver oxidative stress is associated with depletion of PUFA, especially EPA and DHA, and with an important increment of n6/n-3 ratio (6). The molecular mechanisms whereby HFD induced liver steatosis include two principal elements: (i) insulin resistance-dependent peripheral lipolysis and FA mobilization to the liver; (ii) stimulation of hepatic de novo lipogenesis under conditions of liver n-3 LCPUFA depletion (3,4,16). Fish oil supplementation (108 mg/kg/day of EPA and 92 mg/kg/day of DHA) in mice subject to HFD prevents liver steatosis along with prevention of IR and liver oxidative stress. In this context, the fish oil rich in EPA and DHA supplementation is related with prevention and treatment of IR (4,5). This effects are explained by the regulation of lipid metabolism mediated by n-3 LCPUFAs, associated with the following mechanisms: i) activation of peroxisome proliferator- activated receptor-α (PPAR-α) triggers fatty acid oxidation through the induction of expression of acyl-CoA oxidase and carnitine palmitoyl transferase 1-α; ii) down-regulation of sterol regulatory element-binding protein 1c (SREBP-1c) expression and its processing, with inhibition of the transcription of lipogenic genes (fatty acid synthase, acetyl-CoA carboxylase, stearoyl-CoA desaturase-1), reducing de novo lipogenesis (4,6,16). The significant reduction in the increase of hepatic parameters related to oxidative stress generated in HFD group due to fish oil supplementation might be an effect related to an increase in antioxidant capacity generated by these fatty acids in the liver (6,17). These mechanisms would be associated with n-3 LCPUFA indirect antioxidant action, implying regulation of the proteins expression such as heme oxygenase, glutamate cysteine ligase (17), glutathione peroxidase (GPX), glutathione reductase, glutathione S-transferase and catalase, where the main mechanism would be the activation of Nrf2 by lipid peroxidation products of these fatty acids (17). The oxidative stress reduction generated by ω-3 PUFAs are not yet fully understood but some studies suggest that consumption of alpha linolenic acid (ALA), EPA and DHA can reduce oxidative damage in humans and animals (5,18). In other study was observed a significant decrease in plasma concentrations of hydrogen peroxide when performed exercise in athletes supplemented with EPA (2224 mg / day) and DHA (2208 mg / day) (19). In turn, there was an increase in plasma levels of GPX, superoxide dismutase (SOD) and iron reducing potential along with a decrease in malondialdehyde levels in hemodialysis patients receiving 3g/day of EPA/DHA for 2 months (20). A similar situation was observed in older adults supplemented with 2 g of fish oil/day (25% EPA, DHA 52.4%, 5.8% docosapentaenoic acid (DPA)) which increased both the plasma activity of SOD and glutathione concentration (21). In the same way, in other study was found that dietary supplementation for 30 days with fish oil (0.4 g/kg/day) increased erythrocyte catalase activity and decreases the plasma levels of malondialdehyde and NO in male Wistar rats fed a normal diet (22). EPA and DHA depletion and their content in liver induced by HFD in non-supplemented mice versus animals subjected to fish oil supplementation were significantly different. EPA and DHA were significantly reduced in mice fed with HDF. In addition, EPA was significantly more reduced than DHA. The significant depletion of EPA and DHA in (d) group can be attributed to the consumption of this fatty acid for the activation of hepatoprotective mechanisms to prevent liver steatosis, IR and liver oxidative stress. So, the effects produced by fish oil dietary supplementation can be explained directly by the presence of EPA and DHA, as well as fatty acid derivatives such as resolvines and protectins (10). Results from the present study can establish that supplementation with fish oil prevents liver steatosis, IR and liver oxidative stress in mice fed with HFD, where this effects are directly correlated with liver oxidative stress status (GSH/GSSG, protein carbonyl and 8-isoprostanes). Future works must be focused on the study of molecular mechanisms involved in the hepatoprotection generated by fish oil supplementation against the injury induced by HFD in mice, especially the mechanisms that may involve lipid metabolism (PPAR-α, PPAR-γ and SREBP-1c), redox activation of Nrf2 and/or downregulation of inflammatory gene expression through interactions involving n-3 LCPUFA-dependent PPAR-α activation and further PPAR-α-mediated inhibition of NF-kB p65 subunit by inactive complex formation. In addition to studying the fish oil beneficial effects will be necessary to evaluate whether this effect is observed in oils rich in α-linolenic acid where the consumption of this oils produce an increase in both hepatic content of EPA and DHA and in PPAR-α expression (23). Bellentani S., Marino M. Epidemiology and natural history of non-alcoholic fatty liver disease (NAFLD). Ann Hepatol. 2009; 8:S4-S8. Alberti K.G., Zimmet P., Shaw J. IDF Epidemiology Task Force Consensus Group. The metabolic syndrome - a new worldwide definition. Lancet. 2005; 366: 1059- 62. Musso G., Gambino R., Cassader M. Recent insights into hepatic lipid metabolism in non-alcoholic fatty liver disease (NAFLD). Progr Lipid Res. 2009; 48: 1-26. Videla L.A., Rodrigo R., Araya J., Poniachik J. Insulin resistance and oxidative stress interdependency in nonalcoholic fatty liver disease. Trends Mol Med. 2006; 12: 555-8. Poudyal H., Panchal S.K., Diwan V., Brown L. Omega-3 fatty acids and metabolic syndrome: Effects and emerging mechanisms of action. Prog Lipid Res. 2011; 50: 372-87. Valenzuela R., Videla L.A. The importance of the long-chain polyunsaturated fatty acid n-6/n-3 ratio in development of non-alcoholic fatty liver associated with obesity. Food Funct. 2011; 2: 644-8. Uauy R., Mena P., Rojas C. Essential fatty acids in early life: structural and functional role. Proc Nutr Soc. 2000; 59: 3-15. Brenner R.R. Hormonal modulation of Δ6 and Δ5 desaturases: case of diabetes. Prostag Leukotr Ess. 2003; 68: 151-62. Campoy C., Escolano-Margarit M.V., Anjos T., Szajewska H., Uauy R. Omega 3 fatty acids on child growth, visual acuity and neurodevelopment. Br J Nutr. 2012; 107: S85-106. Serhan C.H., Petasis N. Resolvins and Protectins in Inflammation Resolution. Chem Rev. 2011; 111:5922-43. Mardones M., Valenzuela R., Romanque P., Covarrubias N., Anghileri F., Fernández V., Videla L.A., Tapia G. Prevention of liver ischemia reperfusion injury by a combined thyroid hormone and fish oil protocol. J Nutr Biochem. 2012; 23: 1113-20. Capanni M., Calella F., Biagini M.R., Genise S., Raimondi L., Bedogni G., Svegliati-Baroni G., Sofi F., Milani S., Abbate R., Surrenti C., Casini A. Prolonged n-3 polyunsaturated fatty acid supplementation ameliorates hepatic steatosis in patients with non-alcoholic fatty liver disease: a pilot study. Aliment Pharmacol Ther. 2006; 23: 1143-51. Piro S., Spadaro L., Russello M., Spampinato D., Oliveri C.E., Vasquez E., Benigno R., Brancato F., Purrello F., Rabuazzo A.M. Molecular determinants of insulin resistance, cell apoptosis and lipid accumulation in non-alcoholic steatohepatitis. Nutr Metab Cardiovasc Dis. 2008; 18: 545-52. 14. Reznick A.Z., Packer L. Oxidative damage to proteins: spectrophotometric method for carbonyl assay. Methods Enzymol. 1994; 233: 357-63. Bligh E.G., Dyer W.J. A rapid method of total lipid extraction and purification. Canadian J Biochem Physiol. 1959; 37: 911-7. Pettinelli P., Del Pozo T., Araya J., Rodrigo R., Araya A.V., Smok G., Csendes A., Gutierrez L., Rojas J., Korn O., Maluenda F., Diaz J.C., Rencoret G., Braghetto I., Castillo J., Poniachik J., Videla L.A. Enhancement in liver SREBP-1c/PPAR-α ratio and steatosis in obese patients: correlations with insulin r e s i s t a n c e and n-3 long-chain polyunsaturated fatty acid depletion. Biochim Biophys Acta. 2009; 1792: 1080-6. Gao L., Wang J., Sekhar K.R., Yin H., Yared N.F., Schneider S.N., Sasi S., Dalton T.P., Anderson M.E., Chan J.Y., Morrow J.D., Freeman M.L. Novel n-3 fatty acid oxidation products activate Nrf2 by destabilizing the association between Keap1 and Cullin3. J Biol Chem. 2007; 282: 2529-37. Valenzuela R., Espinosa A., González-Mañán D., D´Espessailles A., Fernández V, Videla L.A., Tapia G. N-3 long-chain polyunsaturated fatty acid supplementation significantly reduces liver oxidative stress in high fat induced steatosis. Plos One. 2012; 7:e46400. Bloomer R.J., Larson D.E., Fisher-Wellman K.H., Galpin A.J., Schilling B.K. Effect of eicosapentaenoic and docosahexaenoic acid on resting and exercise-induced inflammatory and oxidative stress biomarkers: a randomized, placebo controlled, cross-over study. Lipids Health Dis. 2009; 19, 8-36. Tayyebi-Khosroshahi H., Houshyar J., Tabrizi A., Vatankhah A.M., Razzagi Zonouz N., Dehghan-Hesari R. Effects of omega-3 fatty acid on oxidative stress in patients on hemodialysis. Iran J Kidney Dis. 2010; 4, 322-26. Romieu I., Garcia-Esteban R., Sunyer J., Rios C., Alcaraz-Zubeldia M., Velasco S.R., Holguin F. The effect of supplementation with omega-3 polyunsaturated fatty acids on markers of oxidative stress in elderly exposed to PM(2.5). Environ Health Perspect. 2008; 116, 1237-47. Iraz M., Erdogan H., Ozyurt B., Ozugurlu F., Ozgocmen S., Fadillioglu E. Brief communication: omega-3 essential fatty acid supplementation and erytrocytes oxidant/antioxidant status in rats. Ann Clin Lab Sci. 2005; 35, 169-73. González-Mañán D., Tapia G., Gormaz J.G., D'Espessailles A., Espinosa A., Masson L., Varela P., Valenzuela A., Valenzuela R. Bioconversion of α-linolenic acid to n-3 LCPUFA and expression of PPAR-alpha, acyl coenzyme A oxidase 1 and carnitine acyl transferase I are incremented after feeding rats with α-linolenic acid-rich oils. Food Funct. 2012; 3: 765-72.